The Environmental Protection Agency is one of the hardest-hit agencies in President Trump's preliminary budget. The blueprint slashes the EPA's budget by nearly one third. 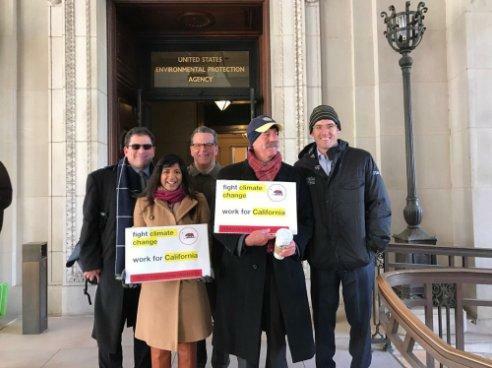 The California Public Utilities Commission president responded by standing outside the EPA building in Washington D.C. while wearing a sandwich board that read, "Fight Climate Change. Work for California." The budget also proposes cuts to regional environmental programs, currently used to fund wetlands restoration and monitor water quality in the Bay. Those responsibilities would be transferred to state and local governments. Federal money may slightly increase, under the budget, for drinking and wastewater infrastructure – Bay Area water districts have used such money to help build wastewater treatment facilities and repair reservoirs. Local transit projects would lose over a billion dollars in expected funding. The cuts would put several projects in jeopardy, including Caltrain's electrification project, BART's San Jose extension, and BART car and equipment upgrades. Funding for Amtrak's long distance lines would be eliminated.